Since the end of the monopoly of the Real Fábrica de Naipes de Macharaviaya (Spain) in 1815, there have been a number of importing agents, as well as manufacturers from other countries, who have imported playing cards into Argentina. 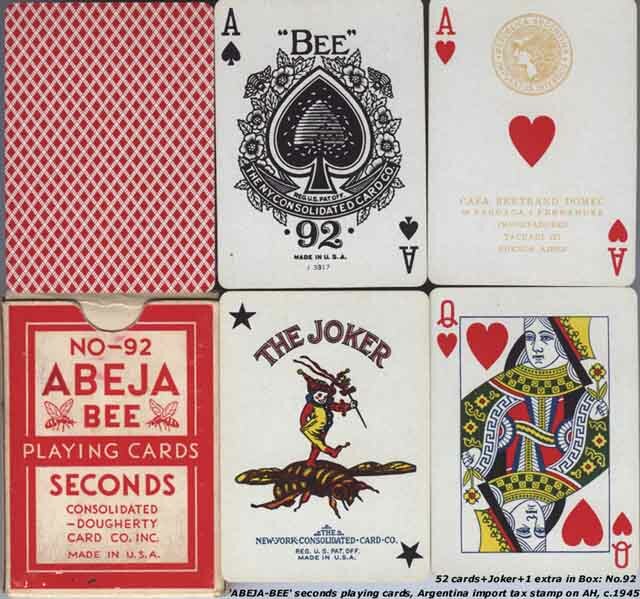 In general, and until 1968, these packs will show the Argentinean importation tax stamp "Impuestos Internos" on the ace of hearts for Anglo-american style decks, or on the four of cups in Spanish-suited packs, as illustrated in the examples shown below. 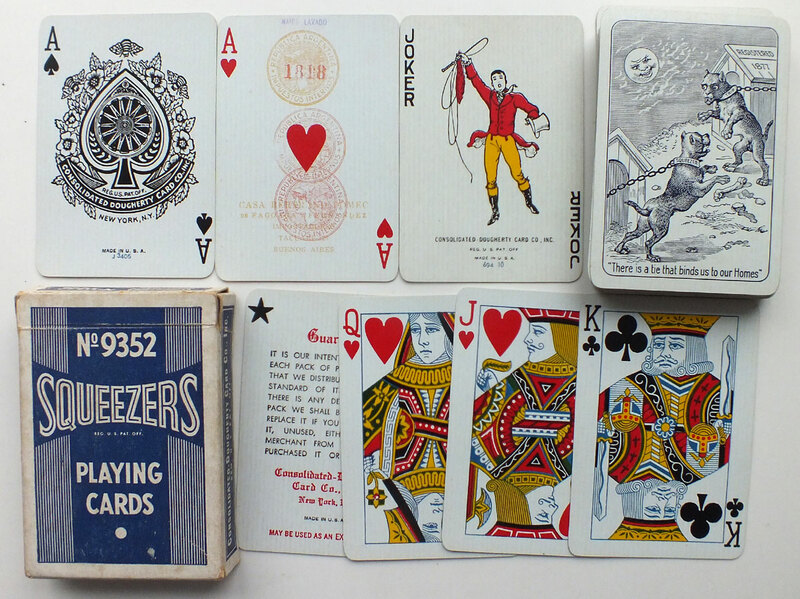 Above: "No.9352 Squeezers" manufactured by Consolidated Dougherty Card Co Inc., New York, for export to Argentina. The ace of hearts features three orange "Impuestos Internos" tax stamps instead of the usual one, and a small overprint 'Naipes Lavados'. This refers to the practise of refurbishing used decks which were then taxed for a second time. The importer's name Casa Bertrand Domec is overprinted on the ace of hearts. Similar packs were also imported into England by Mudie & Sons. 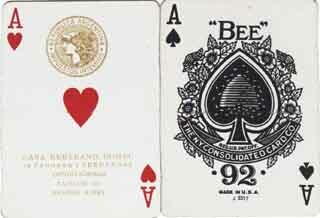 Above: two cards from "NO-92 ABEJA/BEE" playing cards for import into Argentina, manufactured in USA by The N.Y. Consolidated Card Co (Consolidated-Dougherty Card Co. Inc). 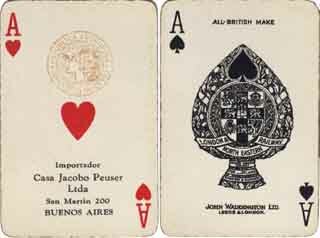 The importer's details on the ace of hearts reads: "Casa Bertrand Domec de Fagoaga y Fernandez Importadores, Tacauri 127, Buenos Aires". 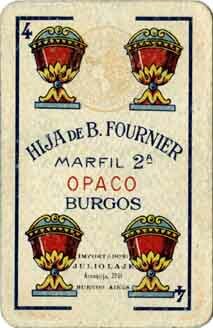 Above: four of cups from a pack manufactured by Hija de B. Fournier, Burgos, Spain in around 1931, subsequently imported into Argentina by Julio Laje whose details are printed at the bottom of the card. The pale brown "Impuestos Internos" tax stamp is visible in the upper half of the card. 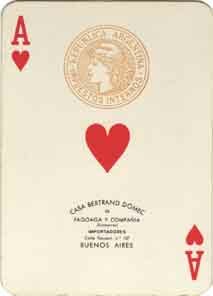 Above: ace of hearts from a pack manufactured by Heraclio Fournier, Vitoria, Spain in around 1955-60, subsequently imported into Argentina by Bertrand Domec whose details are printed at the bottom of the card and also on the tuck box. The pale brown "Impuestos Internos" tax stamp is visible in the upper half of the card. Left: side panel from a Spanish-suited pack manufactured in West Germany by F.X.Schmid Argentina S.A. in the 1980s. The pack is an almost identical copy of packs manufactured by Cia Fabril Financiera S.A. and Joker S.A.